Brody Dalle is an Australian-born singer-songwriter and guitarist. 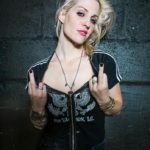 Dalle began playing music in her adolescence, and moved to Los Angeles, California at age eighteen, where she founded the punk rock band The Distillers. The group released three albums before disbanding in 2006, and Dalle began another project, Spin nerette, releasing an eponymous album in 2009. In 2014, she released Diploid Love, her first album under her solo name. "We also listen to PJ Harvey; a lot of driving music. You need something a little more relaxing in the car."